Over the next ten years, Bill Gates plans to spend $10 billion on vaccines for children in the developing world. That’s more than double what his Bill and Melinda Gates Foundation has spent in the past ten years, and which is already seen as a phenomenal success. At the TED conference last month, however, he put vaccines for the poor countries aside in order to address climate change as he thinks energy and climate are most important to those same poorest countries: climate determines if crops grow or not, and energy prices determine what they can afford. Gates says we need energy miracles, and now we have a deadline. 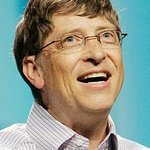 To reduce C02 output to near zero, which is the necessary target according to current scientific predictions, Gates thinks TerraPower might have an answer. He is placing his hopes on innovation and he’s backing a traveling wave reactor design that would supply the world’s energy using mostly the depleted uranium waste from today’s reactors, of which there is plenty, instead of using only enriched uranium like current reactors. Nevertheless, he recognizes the need for many solutions.